My partner has start working and the kids are gone with their other parents, so I'm home alone. It is nice but a bit lonely in the long run. I like use my time for different projects and hobbies, gardening is one of them. On the south side of the house, the sun and the houses creates a warm spot for plants like tomatos, lemons, lavender, etc. I bought seeds of a chili called coffe this year. The plant looks nice with purple flowers and fruits black as sin, or coffe. But the heat is missing, I can use it raw in salads and people will beleive I have used tiny paprika. 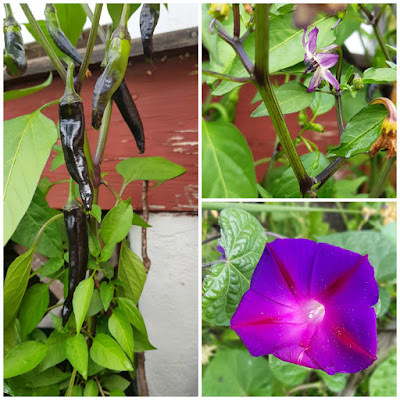 The purple flower is Ipomoea Purpurea (latin), I saw this growing wild in Greece and fell instantly in love with it. I have a box on the south side were I intended to grow basil and cucumber. Well I got a pumpkin instead. If you lift the plate sized leafs and look underneath, you find the basil. Let's take a stroll to the backyard were my vegetable beds are. 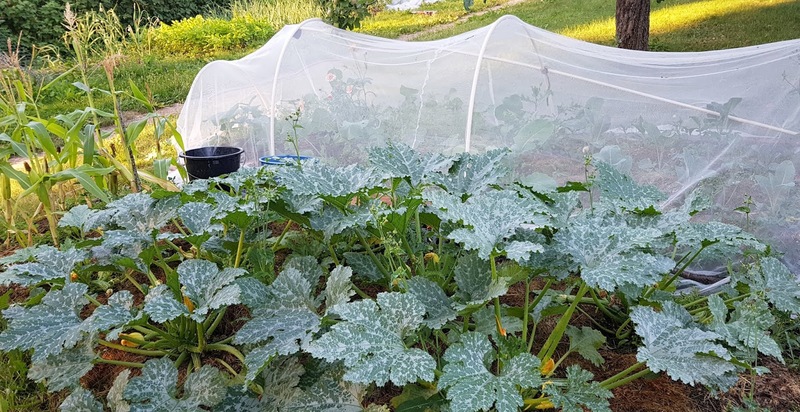 Under the net curtain (Jill from Ikea) hides cabbage and cauliflowers. This is the only way to grow cauliflowers without larvaes. Zucchini is my every year staple. I grow them from my own seeds. It has become expensive to buy seeds and the number of seeds in a package are reduced. So if you like to grow veggies like me, learn how to grow seeds as well. You can se some short corn plants to the left. This is my bed of roots. 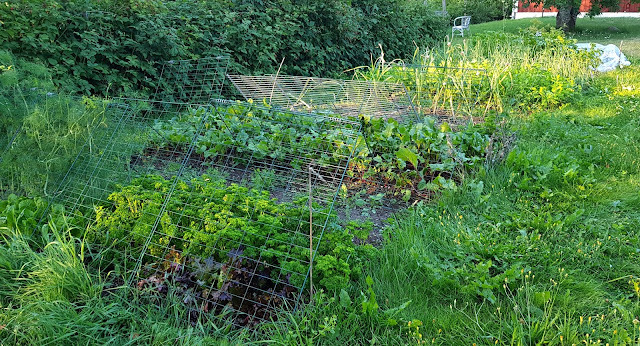 But the one first in view , under the compost fence is salad, parsil and dill. I have a couple of deers living nearby who think this is a buffé of delicasies. The bed behind is beetroots. Swedish people love pickled beetroots. I also grow garlic, parsnips, challots and carrots. As we don't have any water restrictions, I water my vegetables shamelessely. But I save water from the tap and rinse water from the clothes wash for my plants. 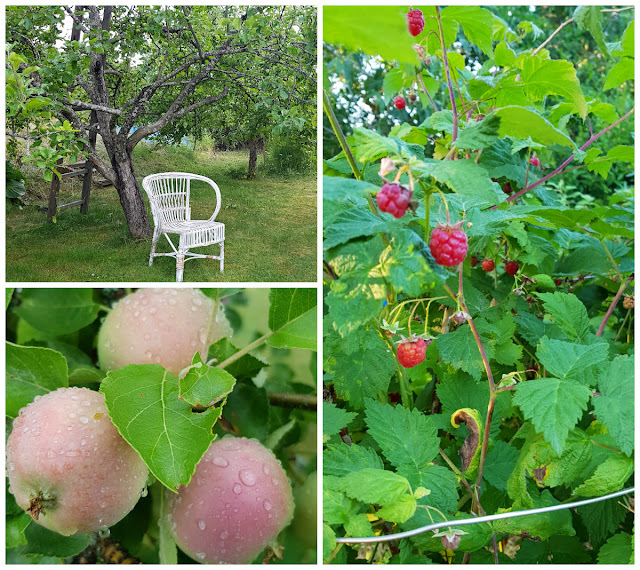 The sad part of my garden. 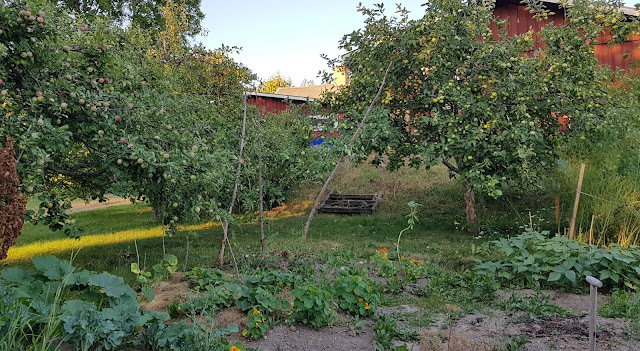 The apple trees are bending towards the ground with so many apples, but they are falling because of the drought. I have cucumbers, borlotti beans and pumpkins in this part. I also have covered a part with a plastic cover, because lack of time in the beginning of summer. The cucumber plants might look small but they produce nice pickle cucumbers. I made my first jar a couple of days ago. These are to die for. They are very popular among my friends. In a sauce pan, bring following ingredients to boil. 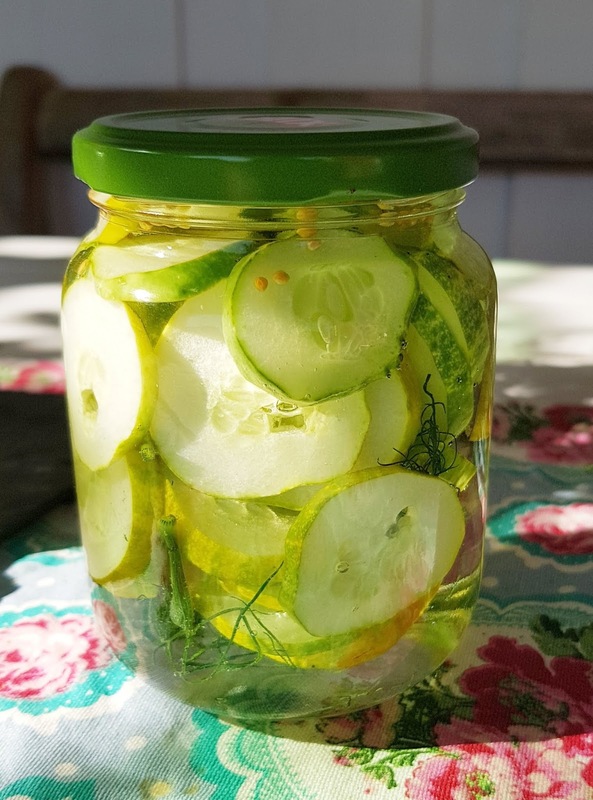 Rinse and slice the cucumbers (the kind for pickling) and put them in a clean jar. You can add dill flowers and mustard seeds if you like. Try to fill the jar as much you can. Pour the boiling pickle juice over the cucumbers and seal the lid tight. If it is air tight, the jar can be stored for at least a year. I rarely take the time to rest. But sometimes I need to sit down and think for a while. An old rattan chair, that I got from my grand father is to rattly to use indoors, but fits perfect for short rests for me. What a beautiful garden! It's a wonderful gift to have fresh produce without needing to go to the grocery store. Vi bor på en vattentäkt och jag har vattnat mycket. Kolla upp bokashi-kompost om du vill ha jord som håller vatten bättre. Eller bygg hügelbädd.